Overall, Preacher Season Two is a somewhat uneven season but still enjoyable for the most part. It will be interesting to see what they do next. 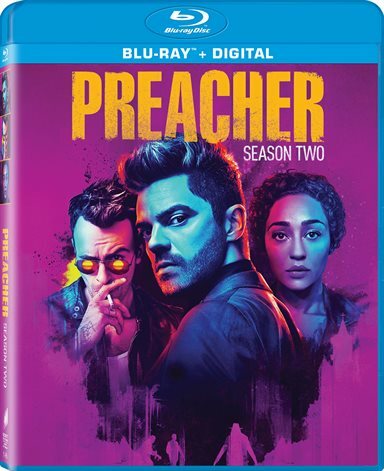 In the ever-growing world of graphic novels turned movie/television shows, AMC's Preacher is well on its way to Season 3 in 2018 and Season 2 out for release on Blu-ray, DVD and Digital download this week. The Seth Rogen/Evan Goldberg run production continued to delight fans this year with a "road trip" and the same snarky humor that they loved from Season 1. While the tone of Season 2 is a little darker than the first and the ideas are more "out of left field", the show still has that overall feeling of dark humor. With great characters portrayed by an almost perfectly cast group of actors, Season 2 doesn't disappoint. At the end of Season 1, we see Annville destroyed and Jesse (Dominic Cooper; Abraham Lincoln: Vampire Hunter) formulating a plan to "find God" (nothing metaphorical about that though). As Season 2 begins, Jesse, Tulip (Ruth Negga; Loving) and Cassidy (Joseph Gilgun; Pride) find themselves in a mess of trouble with the Saint of Killers (Graham McTavish; The Hobbit Trilogy) hunting them down in order to destroy them. Meanwhile, in their "quest", they find themselves in New Orleans since it seems God likes Jazz music and what better place to find it then in the heart of the "big easy". The rest of the season revolves around avoiding the people trying to kill Jesse with some awkward and hilarious moments in between. Among them is seeing Eugene (Ian Colletti; Jimmy) in Hell and dealing with Hitler (Noah Taylor; Edge of Tomorrow) (someone please explain to me how a show manages to find humor in Hitler). We also see a flashback to Jesse's life as a teenager and we end the season with Jesse assuming the role of the new Messiah. As the 13th episode ends, Tulip is fatally shot, God reappears and Eugene and Hitler escape Hell which should make for an interesting Season 3. The series has some really good things going for it and one of those is most definitely the cast. Cooper fits nicely into the lead role as he exudes an air of confidence and infuses the Preacher with a little bit of "devil". Gilgun with his heavy accent is a less than polished vampire but effective none the less. The gem of this cast though is Negga. As the sharp dialogue drips from her mouth, you can't help but laugh at the absurdity of it all. The rest of the supporting cast really help bring the show to life with a special honorable mention to McTavish. Another good thing is the writing and the various directors. While season two loses traction along the way, it still has some great moments to keep the viewer interested. Rogan and Goldberg are among a few different directors for the series and they all do a nice job of keeping the thematic quality throughout the series. The 1080p high definition video quality is a little haphazard as New Orleans surprisingly doesn't seem to enhance the story much. There are moments that pop but otherwise the scenes tend to be dusty and drab. The details are still strong but sometimes it just has a little too much noise. The DTS-HD master audio 5.1 is demo quality delivering thunderous gunshots and sharp dialogue. The combo pack offers only two features besides the Digital download, which is somewhat disappointing. The gag reel isn't as funny as it could be but Raising the Stakes: Action on Set gives some nice detail. Overall, a somewhat uneven season but still enjoyable for the most part. It will be interesting to see what they do next. Download Preacher: The Complete Second Season from the iTunes Store in Digial HD. For more information about Preacher visit the FlickDirect Movie Database.